WHEREVER I TRAVEL in a car, I always see the bridges coming, and when I get to them I always look down. I just have to see the stream. Is the water clear? Is it low? Are there likely looking pools? But we all know what this hasty reconnaissance is really about, don’t we? Maybe — it’s a long shot, but just maybe — I’ll see a rise. To the fly fisher, the rise is both announcement and invitation. It animates the river like nothing else. It is as close as trout come to leaving tracks. Fly fishers have been aware of the trout’s rise and its disturbance of the surface of the stream for a very long time. In The Fly-Fisher’s Entomology (1836), Alfred Ronalds identified the “curl occasioned by the rise” as the target toward which the angler should make his cast. It wasn’t until the late 1800s that reading rises became formalized in print. In Dry-Fly Fishing, Theory and Practice (1889), Frederic Halford, the foremost popularizer of dry flies, rightly emphasized that the fish didn’t simply “grab” the fly between its jaws; instead it actually sucked the fly in. He discussed a few basic types of rises, starting the process by which angling writers would attempt to create a kind of field guide to rises, which would tell them what fly to use. Unlike Davy, Halford preferred to judge the size of a fish not so much by its riseform, but by the noise of the rise. He believed that trouts’ “comparative weights may be said roughly to be arranged in a scale of harmony, the heaviest fish being the lowest bass, and the smallest the highest treble.” And he said that if the pitch of the sound gave you the fish’s size, the volume of the sound gave you the size of the insect it was taking: the bigger the bug, the louder the rise. It was also Skues who seems first to have realized that the presence of bubbles in a dissipating riseform are proof that the trout is, indeed, taking on the surface. Only if a trout sucked in air along with the insect could it possibly eject any bubbles into the riseform. British fishing writer Eric Taverner, who originated the term ‘riseform,’ expanded Skues’s list of riseforms in Trout Fishing from All Angles (1929), raising the total to about 16. But by the time of Taverner, the reader, slogging dutifully through these earnest treatises, must have noticed some awkward strain and torque in the rhetoric. The distinctions were getting too fine. Taverner’s “sucking riseform,” his “sip to a medium sized fly in an eddy,” his “spotted ring,” and his “sip rise” must have seemed to readers even in his day as pretty hard to tell apart. The theoretical edifice was getting a bit bloated for practical purposes. Or at least that seems to be the judgment of most later writers. Almost 50 years after Taverner published his list, Ernest Schwiebert’s encyclopedic Trout (1978) set a record for the most distinct riseforms described, cataloging about 20, including all of Taverner’s and a few more. But otherwise, a more conservative approach has prevailed. Americans have generally shown less interest in dissecting the finer points of the riseform. George LaBranche, in his pioneering masterpiece of American dry-fly fishing,The Dry Fly and Fast Water (1914), regarded the study of subtle differences of riseforms as unnecessary on the mountain waters that he fished. The water was just too rough to see all those subtle things happening. But at the same time, later American observers did add interesting and important additions to the lore of rising trout, especially on quiet waters. Pennsylvania spring-creek fisherman Vincent Marinaro’s A Modern Dry-Fly Code (1950) and In the Ring of the Rise (1976), the latter containing beautifully revealing photographs of feeding trout, described the compound rise and complex rises, in which trout perform extended inspections of the fly while drifting along under it. He also described “gobbling” behavior, in which rises are essentially joined into one continuous feeding episode when flies are superabundant on the surface. 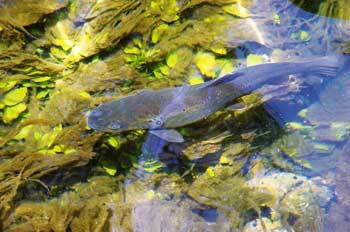 When a fish moves to intercept a fly, it displaces water. And it is true that there is a direct relationship between the speed of the fish, and the violence with which the water is disturbed. But the disturbance itself can and does take on almost any shape, give or take a broad circular movement that is influenced by the current, once the action is over. What we face in reading the rise is the very problem faced by George LaBranche. Fishing writers have always observed and described rising trout in quiet water because that’s where they can see them well. But such distinctions are much harder to make, and may be impossible, in broken water. We can learn only so much from such specific conditions as the quiet waters of spring creeks. What I find encouraging throughout the literature of reading riseforms is not so much the invention of a Unified Theory of the Rise, but the great advantage to be had through local observation. Again and again, it is quite clear that someone, famous or not, expert or not, has encountered a situation on this or that stream where fish behavior resulted in a riseform that had not only meaning but reliable, consistent meaning. We have reached the point where it’s not really up to the experts to improve on this study any more. The inspiration provided by Halford, Skues, Marinaro, and the rest is best directed not just at reading everything they wrote, but at reading the rises your own stream.